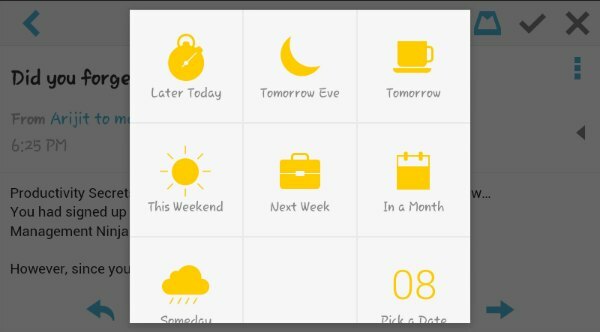 When was the last time you tried a productivity app that really amazed you? The best apps start saving you time right away. They are easy to learn, easy to use and have a free version that you would be happy to pay for! Mailbox is all of the above, except, that it’s completely free! You might still stumble upon something new in this post! Lots of Mailbox users don’t use all of its secret weapons. Do you treat your inbox as a To-Do list? Doing so has a number of pitfalls. You will scan your inbox multiple times during the day to figure out what actions you need to take. Since all emails don’t require action, you waste seconds and even minutes every time you scan your inbox. These seconds and minutes accumulate into anything between 10-30 wasted minutes by the end of the day. 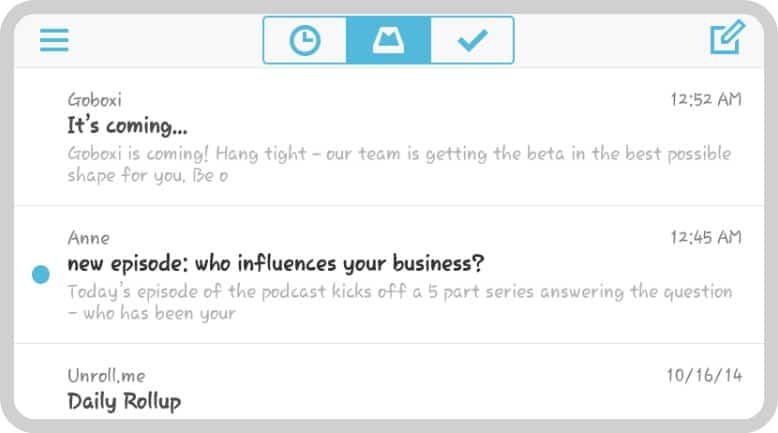 Mailbox has an in-built to-do list to which you can add all emails that require an action. 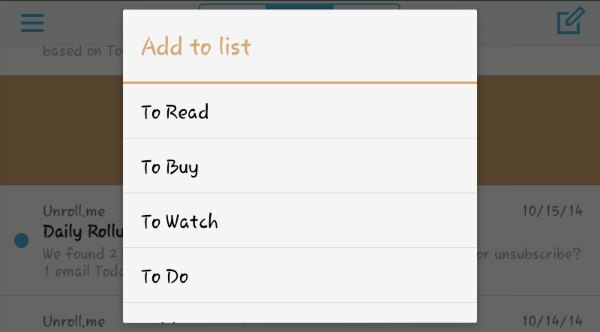 You can also create different lists based on the nature of the task. Which emails do you need to take action on today? Will you add emails which don’t require action today to your To-Do list? Doing so usually leads to a list longer than a giraffe’s neck. If these emails remain in your inbox, they will be an unnecessary visual distraction which will slow down your scanning time. 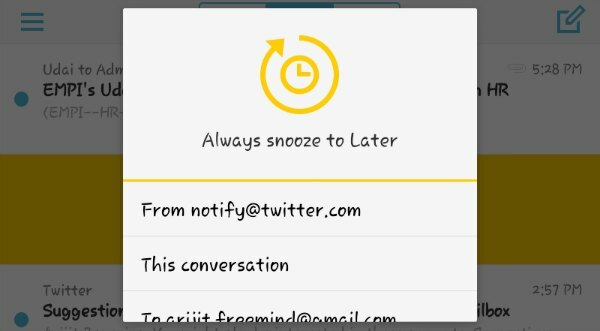 With Mailbox, you can snooze an email for later – 3 hours, 3 days, or any other custom time during which it disappears from your inbox and you can forget about it. The email will magically reappear in your inbox after the designated time. How easy (or even useful!) do you find the concept of Inbox Zero? To many of us, reaching Inbox Zero is as simple as climbing Mount Everest! Most of us don’t even start to attempt inbox zero for one simple reason – If you have a thousand emails in your inbox, the last thing you want to do is sort through them, deleting or archiving as you go. Finally someone realized that we are all not born on Krypton and we need a hand getting to Inbox Zero. With a single click, you can archive all your mails. You can even leave out the unread and the starred ones, and archive the rest. How many email accounts do you check regularly? I have 3 . Back in my Gmail app days (seems so long ago! ), I had to check each account separately. Mailbox shows you all your emails in a single inbox, allowing you to check your emails with a single glance. No more switching back and forth. Of course, if you prefer to keep your email accounts separate, all you have to do is add your most important email account with Mailbox. 5. Auto Swipes – your new Superpower! Mailbox is all about easy swipes! You delete, snooze and archive with single swipes, which saves you loads of time. You can even archive or delete multiple emails at the same time with a single swipe. There’s also something called auto swipe – where the app automatically takes an action based on rules that you specify. For example you can choose to snooze all emails from a particular sender till evening. Mailbox can help you win back 20 extra minutes a day…maybe more. At the moment Mailbox is available only on iPhone, Gmail on Android and the Mac desktop. If you use any of these, be sure to add this to your productivity arsenal! If you are already a user start leveraging those unused features to make your day even more productive. Are there any other Mailbox features that you like?